The entry form for the 2012 Inspire Awards Competition can now be downloaded. Just complete the "typable" PDF entry form, attach a copy of your materials and cover letter (optional), then hit "Send." Complete your entry form online now. LATE FEE WAIVED — SUBMIT YOUR ENTRY BY 1 MARCH 2013. ▪ STATUETTES & PLAQUES AVAILABLE TO ALL PARTICIPANTS. Available to all contenders to recognize involvement. In-house production ensures quick delivery of custom materials to highlight participation and/or award recognition. Additional materials ship quickly and inexpensively. ▪ ENHANCED RESULTS KITS. Now 20+ pages of competition coverage, individual metrics and feedback; a CD packed with resources; and other important supplemental materials. ▪ MORE OPPORTUNITIES TO WIN. More categories offered, providing a greater platform on which to earn recognition for your specific program. Nothing distinguishes your work and brings recognition to you and your team more than honors from the 2012 Inspire Awards. The Inspire Awards recognizes the outstanding internal & employee communications programs of the past twelve months. From Abbott to Zurich Financial, organizations large and small compete against peers of similar size, staff, and means to earn recognition for their organization's achievements. Here's your chance to earn due recognition for your hard work in communications. As the world's premiere internal & employee communications competition, the Inspire Awards provides a platform for communications professionals to demonstrate the value they're delivering to their organization. Judged across a broad range of criteria, awards are presented across five tiers: platinum, gold, silver, bronze, and honors. Ratings are based upon an evaluation point system, which considers a number of factors measuring the effectiveness of communications materials. In order to maintain equity during the evaluation process, materials are also classified and considered according to organization size and revenue. Further, individual honors are also being awarded to entrants participating in category-specific competitions. Whether you focus on communications for a corporation, non-profit organization, governmental, or educational entity, LACP's Inspire Awards competition is a chance to have the high quality of your work validated by one of the most respected competition forums in the world. The Call for Entries concludes 15 February 2013. (1 March 2013 with extension fee.) So don't delay; be sure to submit your entry today! � Statuettes for Platinum Award Winners. Each one is customized to you, your project, and/or your company. � Full-Blown Winners Kits. Tailored especially to you and presented in a personalized three-ring binder, these kits walk you through the entire judging process and provide you with your individual results. This kit is an excellent addition to any communicator's portfolio. � New, Detailed Scorecards. All entrants receive individualized score cards highlighting their entry's performance across a broad range of categories. The thumbnail analysis provides a clear and simple picture about your communications materials. strengths & weaknesses. � Award Certificates for All Honorees. Handsomely designed for framing, these attractive, embossed certificates describe the winning entry and the person(s) who led and contributed to its development. � Online Winners' Showcase. Individual Winners' Profiles are developed and posted online for each honoree. Highlighting the winning entry and the team that made it possible, this online showcase is a great resource to promote your hard work. � Winners' Logos on CD. 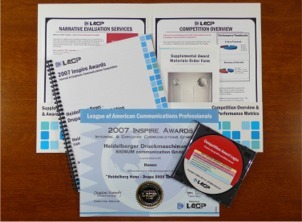 All honorees gain access to their specific award logo for reproduction through the CD-ROM enclosed with their Results Kit�a perfect way to showcase your entry's achievements. � More Defined Competition Classifications. This year's competition better pinpoints exactly which companies you should be competing against in order to create the fairest competition. Based on a logarithmic scale, the classifications will ensure that your competitors are of similar size and means. � Top 50 Rankings. We name names, identifying the Top 50 internal & employee communications programs across all categories. All entrants are automatically entered in contention for this esteemed award. � Recognition with the News Media. Top-performing honorees are highlighted in LACP's Inspire Awards press announcement, sent to the top news outlets around the world. � Expanded Competition Categories. A good number of PR pros, just like you, have asked for expanded competition categories in areas where communications materials can most shine. We've responded to that request, broadening the number of optional competition categories from eight to nine. The deadline to submit entries for this year's competition is 1 March 2013. Winners will be announced and awards distributed on 1 April 2013. Download the FULL entry form. ∙ Real Feedback. Many other competitions print out awards and send them in the mail without any indication that considerable thought was put into the decision-making. At LACP, we do things differently--we provide you with extensive metrics that tell you exactly where an entry excels or could use improvement. Plus, you gain extensive data on whom you competed against and how you compare. ∙ Real Recognition. LACP is the only organization that offers extensive Winners' Profiles online. Honorees gain dedicated web pages detailing their accolades. In addition, LACP extensively publicizes and promotes competition results. ∙ Professional Judges. Many other competitions use part-time volunteer judges who haven't had the opportunity work in the profession or develop strong critical evaluation skills. The core of LACP's judging staff come directly from the PR/Marcom industry and have established extensive judging experience. They stay sharp because they're performing their duties at LACP each quarter and every year for years and years. ∙ Awards with Meaning. Everyone seems to be a winner in many other competitions. At LACP, our honorees truly have to earn recognition. Word is spreading--there's a reason that our participant base is growing at a rate of 39% each year. ∙ More than a Certificate. Sometimes, the only results seen from a competition is an award certificate or two thrown in a manila envelope. That's unacceptable in our minds--that's why we painstakingly build custom Winners' Kits that give you everything imaginable from a competition--statistics, percentiles, narrative commentary, press releases, artwork, and more. A typical kit is 12+ pages long. The Call for Entry period begins. Three weeks before the Call for Entry period ends. One week before the Call for Entry period ends.